Understand user roles, learn about integrations, and update customizations to make sure your FullStory account runs smoothly. Feeling comfortable with FullStory fundamentals and ready to power up your account setup? Invite teammates, enable guest roles, or both! FullStory sessions spark instant empathy and have an uncanny way of breaking down silos when shared. So, we recommend inviting a crew to navigate FullStory with you. If you're flyin' solo, skip this part and move onto the next. If you work with others, take a moment to consider, "Who else would benefit from being able to search across sessions? Or, should everyone at my organization be able to view a session even if they'll never log in?" Review the user roles that are available: Standard, Admin, and Guest. To invite a Standard or an Admin user (someone who will be able to log into FullStory and search across sessions), click to Settings > Team Settings and click "Invite teammate..."
While you're under Team Settings consider whether you'd like to enable Guest roles. This setting is recommended if you know you'd like to share links to sessions in group chat or project management tools where lots of folks might have access to click the link. It's a big, wild universe out there, and some of the traffic that could land on your site might not be real customer traffic at all. Because your FullStory recording quota is based on sessions and because your analytics in FullStory include all sessions that match your search criteria, it's important to make sure that you exclude traffic from bots or unwanted IP addresses to get the best results. Click over to Settings > Recording & Exclusions and scroll down to look for modules to add Blocked IPs and Blocked User-Agents. Add an individual IP address or User-Agent string to block all traffic from that bot or crawler. Read more about finding the right IP or user-agent string to block in, "Can I block unwanted sessions by IP address or User-Agent or bot?" Connect the critical systems, and plug the power of FullStory into your existing workflows. Using Slack? Turn on integrations to send sessions to channels. Managing bugs in Jira tickets? Enable the integration to make reporting bugs a cinch. Supporting customers with a help desk? Flip the switch to send FullStory sessions to your incoming tickets, so you can see exactly what a customer saw before they contacted support. With FullStory's ever-expanding list of integrations, you're bound to find something that will work for you. 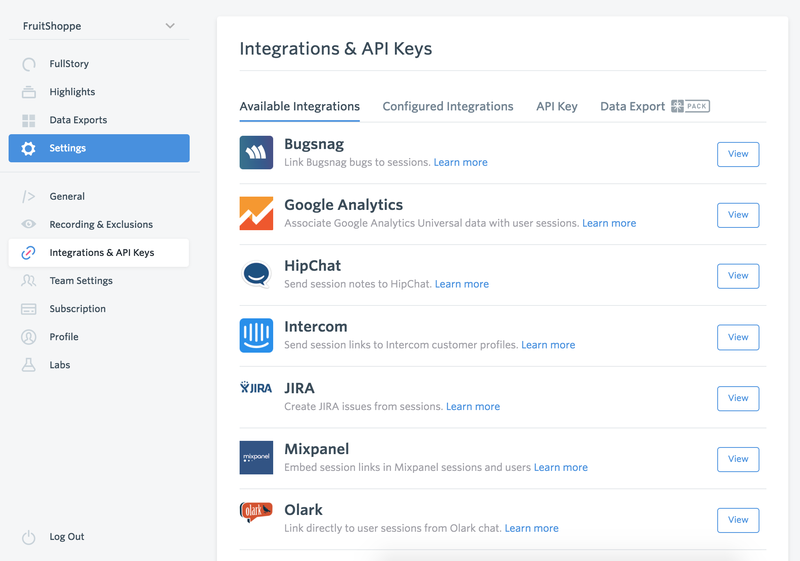 Navigate to Settings > Integrations & API Keys, and make it so. Search and session replay is powerful on its own, but it's super-charged when you start syncing over custom data points that matter to you about your unique customer experience. FullStory provides a mechanism to pass in user-specific variables through the API, using FS.identify and FS.setUserVars. Once you start passing over identifiers and custom user vars, you'll be able to just start typing and search for all users with a specific custom variable data point. Job title? Customer lifetime value? Favorite snack? If you've got the data for a customer, you can send it over with a session. Read all the specs (and/or send them to a helpful web developer or engineer on your team) to get started with custom data. User roles rolled out? Check. Bots blocked? Check. Bugs reported? Integrations activated? Custom data coming through? Check, check, and check. All systems are go! Now, go explore in FullStory.